Pete Politarhos, owner of Zac’s Burgers, and his family have always supported our country’s courageous Veterans. The Zac’s Burgers family continually looks for ways to give back to the community and our brave veterans to honor them for their service to our country. On November 11th of this year the Zac’s Veterans Day Giveaway provided local Vets in Delaware County, PA a delicious, hot Vet Pack consisting of a burger, fries and a drink. It was Zac’s small way of thanking them for their patriotism and their service. But Zac’s wouldn’t stop there. Zac’s Burgers decided to showcase their patriotic side once again. Not even a month after the Veterans Day Giveaway Pete and his family decided to fire up the Zac’s Burger Bus and feed 350 additional Veterans! What better way to honor the men and women who courageously fought for our country than by feeding them during this year’s ARMY Navy Game. 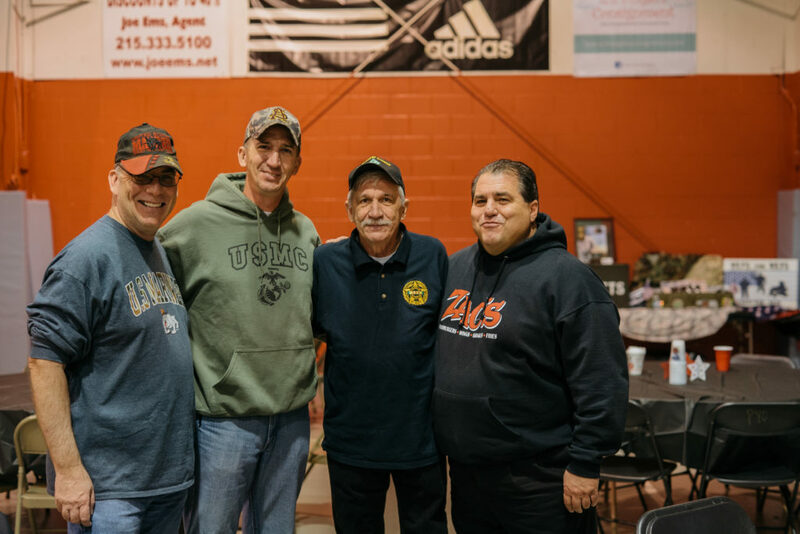 William Moser, brother of John Moser Founder and President of MBB Management whom currently manages Zac’s Burgers, was part of organizing the Parkwood Youth Organization’s 1st Annual Veterans Benefit & Fundraiser. Pete and John saw this as the perfect opportunity and venue for Zac’s to once again show their gratitude to the local Vets and their families. The event was organized as a Beef n’ Beer which took place during this year’s Army Navy Game on December 9th, 2017 at 3301 Mechanicsville Road in Philadelphia. The fundraising event provided veterans who reside at the Delaware Valley Veterans Home (2701 Southampton Road, Philadelphia, PA. 191 54) to enjoy a day out with their comrades and shipmates to watch the 127th showing of the ARMY Black Knights vs. NAVY Midshipmen football game. Hundreds of veterans and their families attended the event. All proceeds are going directly to the Veterans home for personal care items, clothing and their 15th Annual Holiday Party. Zac’s Burgers provided these local heroes with a nice hot meal as the Vets enjoyed a few hours of some good ol’ football and military service rivalry. Zac’s Burgers salutes our veterans who have fought and sacrificed for all the rights and freedoms we hold dear today. We believe it’s essential to say thank you by giving back to them in any way possible. Therefore, we are now actively collaborating with veteran organizations in order to provide special incentives for veterans interested in investing in a Zac’s Burger Bus or burger licensing location. For more information please go to https://zacsburgers.com/vets/.